A legend passed away over the weekend. 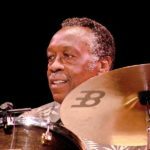 Clyde Stubblefield was the drummer for James Brown, whose revolutionary beats led to songs, albums, and even genres he couldn’t have imagined. Clyde, also known as the Funky Drummer, is the most sampled drummer in history. Shortly after retiring from the James Brown Band, Clyde settled in Madison. WORT sat down with three of Clyde’s family members today to discuss the musician and the man behind the drum kit.